In recent weeks, Trump has narrowed the gap with Clinton in public opinion polls, and the debates could be a pivotal moment before voters cast their ballots on November 8. 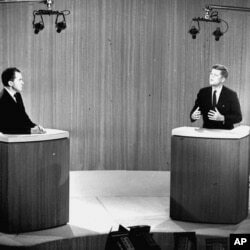 Televised presidential debates have a rich history, beginning in 1960 with candidates Republican Vice President Richard Nixon and Democratic Senator John Kennedy of Massachusetts. “We must give this country leadership and we must get this country moving again,” Kennedy told viewers. 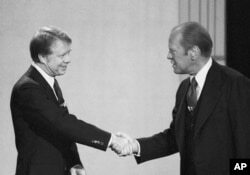 File - President Gerald Ford, right, and Jimmy Carter shake hands before they start their debate. 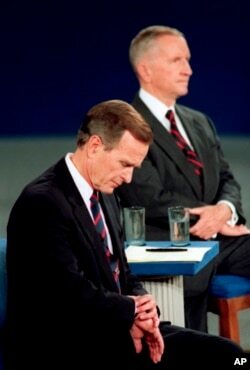 The commission has organized the debates every election cycle beginning in 1988 and is doing so again this year with three presidential debates and one debate between vice presidential candidates Senator Tim Kaine, a Democrat from Virginia, and Indiana Governor Mike Pence, a Republican. 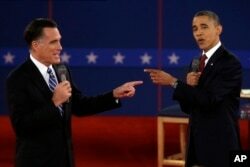 FILE - Republican presidential nominee Mitt Romney and President Barack Obama spar during a presidential debate at Hofstra University. The first presidential debate in the 2016 race is also being held at Hofstra on September 16. In this year’s campaign, both Trump and Clinton have turned in strong performances in their primary debates. Trump skewered his primary opponents like former Florida Governor Jeb Bush and Florida Senator Marco Rubio.